So it’s not wild salmon season yet. Right. I was so excited about the smoking portion of the experiment that I did not think of the fact that I wouldn’t be able to get wild salmon at this time of year (what goodness is there in life before May?). I wanted the rich flavour you get from wild salmon so ended up with frozen (sustainably caught) sockeye filets. In the end I couldn’t get the smoking done Friday as I was already squeezed for time (which now included defrosting). Since I’d already built up anticipation levels previously reserved for Momofuku‘s arrival in Toronto it seemed best not to rush. Do it right. Or screw it up with plenty of time. 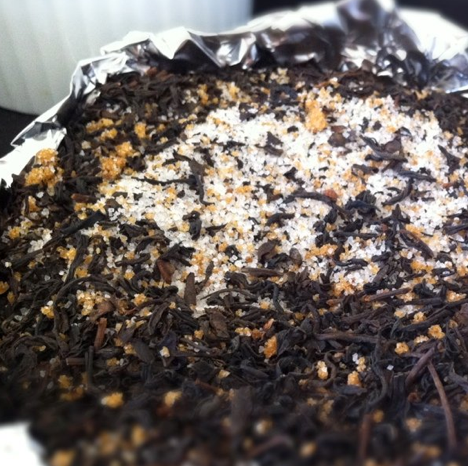 8:00 am: mixed the muscovado (dark brown) sugar, caster sugar and Earl Gray tea together. Handily constructed two little trays from tin foil and divided up the mixture between them. My estimate of what was “7-8 cm” wide was actually more like 13 cm. Luckily tin foil is very squashable. 8:43 am so many things could go wrong. Like that aside from no extractor hood, I don’t have a “tight-fitting lid” for my smoking dish. 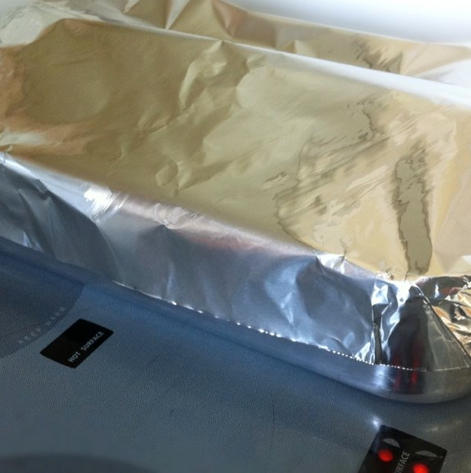 Am going with the heavy-duty tinfoil. Like duct tape in the cooking world, right? 8:45 unplugged smoke detector and opened all the windows. Put salmon on rack in roasting pan. Covered the roasting pan and put it across two burners over med-high. Stood there watching it. Nothing happened. 8:58 Conundrum. 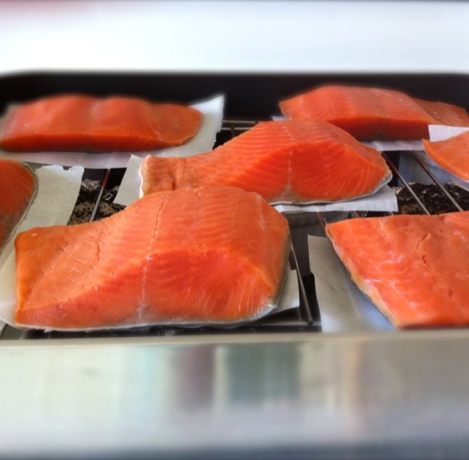 The recipe is broken into two parts: the general “how to” tea smoke section and then the recipe for the salmon specifically. In the salmon recipe it says to leave the salmon smoking for 3 minutes with the heat on and then turn off the heat and leave it another 3-4 minutes. Yet, as the “how to” instructions mentioned, it took about 10 minutes for the smoke to get going and begin infusing the fish. So I was a bit confused–do the 3 minutes start after the 10 minutes? I ended up doing two batches so as not to crowd the pan. The first one which I left the initial 10 minutes (then 3 minutes on heat, 3 minutes off) was a bit overdone for my taste and I kicked myself for not checking it sooner. The second round I actually put in right after I took out the first batch, heat was off, I quickly put the cover (foil) back on and left it five minutes. Checked it and let it cook a little more, til tender and flaky. Much better results. The “being smoked out of house and home” I was so prepared for never transpired. In fact, all went very smoothly. I admit, slightly disappointing. I thought this post would be more dramatic with at least one neighbor coming over to see if we were OK. I removed the salmon and let it cool. The smoky tea flavour was there, subtle and delicate–the wild salmon itself was amazing. I will do this again and next time I think I will try letting the smoking pan heat up for 10 minutes before I add the salmon so that the fish is really being “smoked” rather than just cooked from the initial trapped heat. 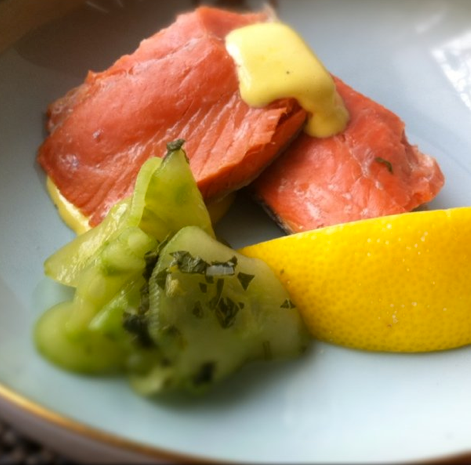 I served the salmon flaked and made lemon mayonnaise to go with it and an amazingly fresh, lime/mint/cilantro cucumber salad (Skye Gyngell’s recipe again). Plus baguette. ***Next time I promise kitchen disaster it will be bad, very bad. I will make up for this.